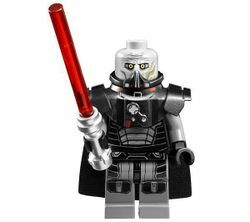 Darth Malgus is a minifigure of the Sith Lord of the same name in in the Star Wars universe, who appears in the 9500 Fury Class Interceptor. Darth Malgus features a grey, bald head with menacing expression, and with several scars. Malgus' body is black with grey battle armour printed on both the front and back. His legs are dark grey with a continuation of his torso printing. Two accessories are placed between Malgus' head and torso. One is a cape that is currently exclusive to this minifigure, which features only one hole as opposed to the usual two. The other is a piece depicting both battle armor and the Sith Lord's respirator, the front of which covers the bottom of his head piece. This piece also features red and silver printing for detailing. Malgus is armed with a red-bladed lightsaber with a silver hilt. Darth Malgus was a Sith Lord during the Old Republic era. He killed his master, Vindican, after he was wounded by the Jedi as the Sith Empire re-took Korriban. During the battle of Alderaan, Malgus was severely wounded by then-Jedi Knight Satele Shan, and was subsequently forced to wear breathing apparatus for the rest of his life. Malgus went on to sack Coruscant and kill the token force left at the Jedi Temple. Different angles of the minifigure. This page was last edited on 12 January 2016, at 22:36.